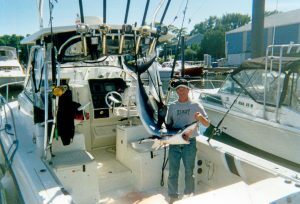 The Kingfisher fishing charter boat is a 2001 Hydra Sports walkaround, with a cuddy cabin and full bathroom. Powered by clean and quiet twin 2017 250 Suzuki outboards, the deep V hull cuts through choppy waters and cruises at 30 Knots. 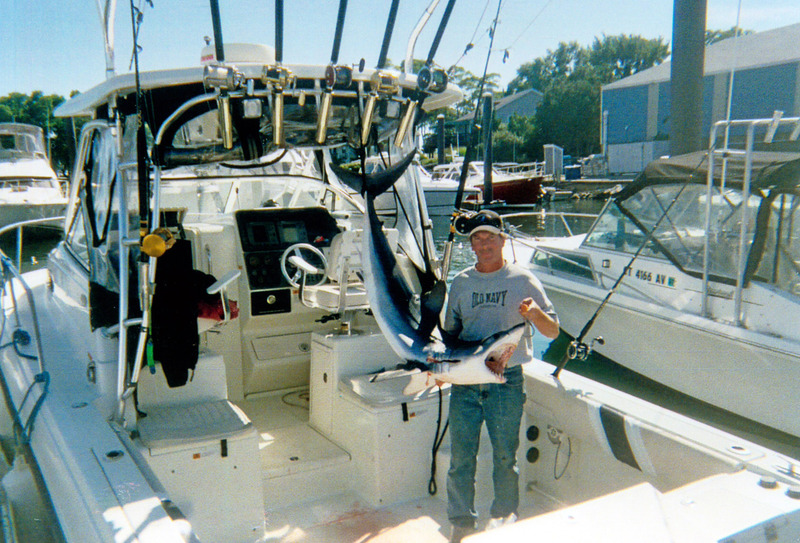 This will get you to the fishing grounds twice as fast as most other CT charter boats, WITHOUT SMELLY DIESEL FUMES. 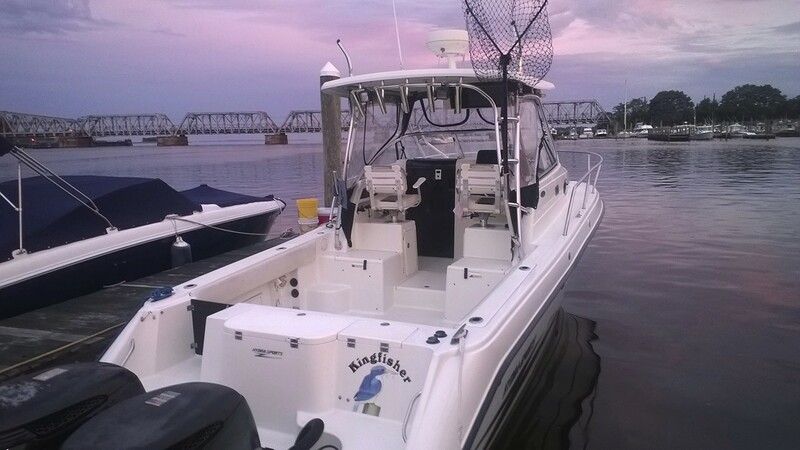 The boat is perfectly set up for fishing live bunker with a 45 gallon live well, 2 large insulated fish boxes, color fishfinder, radar, and all coast guard required safety equipment (including 406 EPIRB). The Preferred fishing equipment used on the Kingfisher includes Diawa Sealine high speed and Penn Squal conventional reels for bottom fishing along with Penn 650 and Spinfisher reels for casting. All reels are loaded with Power Pro braid in the 30-65lb rating. Rods are made by Tsunami, Shakespeare, and Penn. We use the lightest gear that will also stand up to the exceptionally larger fish we target. 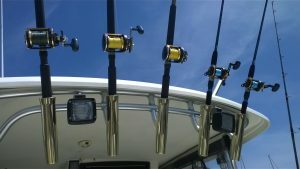 The variety of equipment aboard the Kingfisher allows us to employ every type of sportfishing technique (bottom fishing, casting, and trolling). Terminal tackle/rigs are made with the highest quality Gamakatsu and Mustad hooks connected to custom made rigs designed for specifically targeting each species of fish and the various techniques employed. We have all the bases covered!